The Blue Placemat: Break It Down Now! Let's go back and touch base with our favorite Nutrition Facts Label. Scooting past the calories listed, you'll see a whole boat load of information. Now, you may be very familiar with these nutrients, vitamins, and minerals listed, however; many people find this list a whirlwind of a mess. Overall, we want to keep Saturated and Trans fats, cholesterol, and sodium intakes low. On the other hand, we want to consume foods high in fiber, vitamins A & C, calcium, and iron. Some of us may look at the protein or the total carbohydrates listed (especially diabetics). If you're unsure of your recommended intake levels of specific nutrients (for instance, if 5g of fat per serving is high or low), using the percent daily value (% Daily Value or %DV) may be helpful. The percent daily value is either listed directly after the nutrient or towards the right-hand side of the Nutrition Facts panel. The overall, simplified hint states that if the percent daily value is 5% or below, then that food contains a LOW amount of that nutrient per serving. On the other hand, if the % daily value is 20% or above, then the food is a HIGH source of that nutrient per serving. This rule applies to all nutrients. In this example, the total fat listed is 2.5g, which provides 4% of the percent daily value. Being that this %DV is less than 5%, this food is low in total fat per serving, which may be what you're looking for. 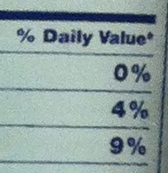 What is the Percent Daily Value exactly? The percent daily value is a percentage of a nutrient in a food and its comparison to how much you need all day. An average person's diet is used to determine this value: a 2000 calorie diet with about 65g total fat (22g saturated fat maximum). Knowing that some of us need more or less than this average diet, our own percent daily values can vary, but as a general indicator about a food and its nutrients, the 5%/20% rule can be quick and easy! Thanks for pulling up a seat. See you next time at the table!